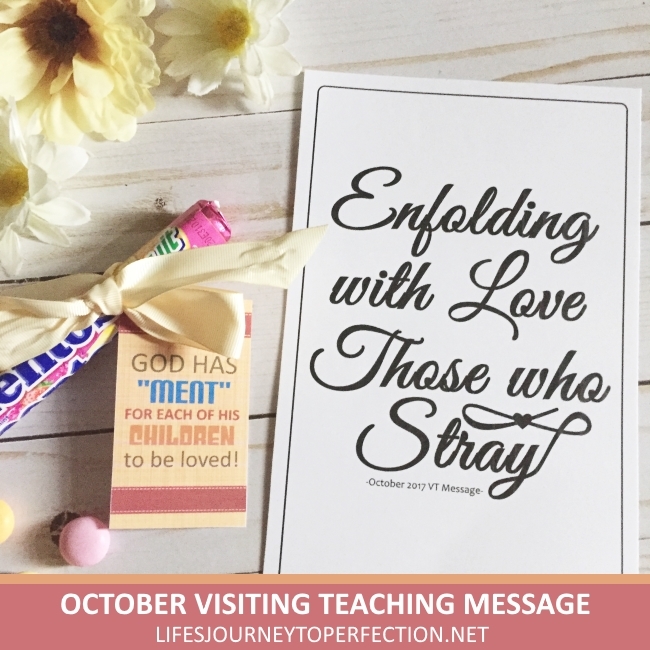 I really have a special place in my heart for this month's visiting teaching message! When I was serving as a Primary President, I attended a meeting where it was said that President Monson, is not just the prophet for the church, but rather for the whole world. So, that also means that as leaders everyone in our ward boundaries is under our care, whether members of the church or not. This message really hit me. It made me look at my calling in a whole new light. That all primary children in my ward boundaries were under my care, my love for them grew and I wanted nothing more then for them to feel that love and inclusion. Since then, this is how I have tried to serve in my callings. Our Heavenly Father truly loves all of His children, He desires all of them to receive the blessings that He has in store for them. The key to this life is to see others as sons and daughters of God. We are each given our agency. Our friends, family members, neighbors, etc all have the opportunity to choose for themselves. We though can have a profound influence as we stay true to our values and covenants. As we love them, stick by them, support them and treat them with kindness. It doesn't mean we agree with their choices, but their choices don't have an effect on our love for them. It doesn't change the fact that they are God's children, nor His love for them, which is perfect. 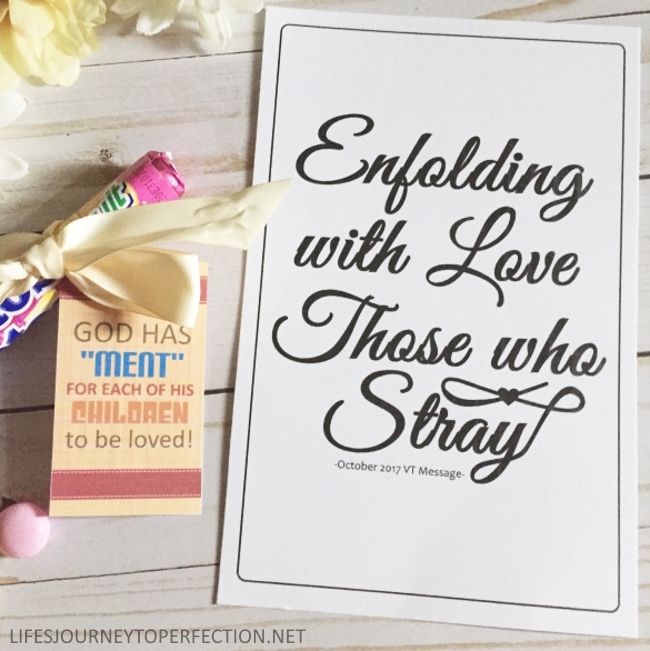 “I have prayed with faith that someone I loved would seek and feel the power of the Atonement. I have prayed with faith that human angels would come to their aid, and they came. I too testify this to be true, sometimes it takes a lot of patience and long suffering. But if we are praying and loving then our Heavenly Father will help us. He will never take away someones will, but He will help in softening a heart. 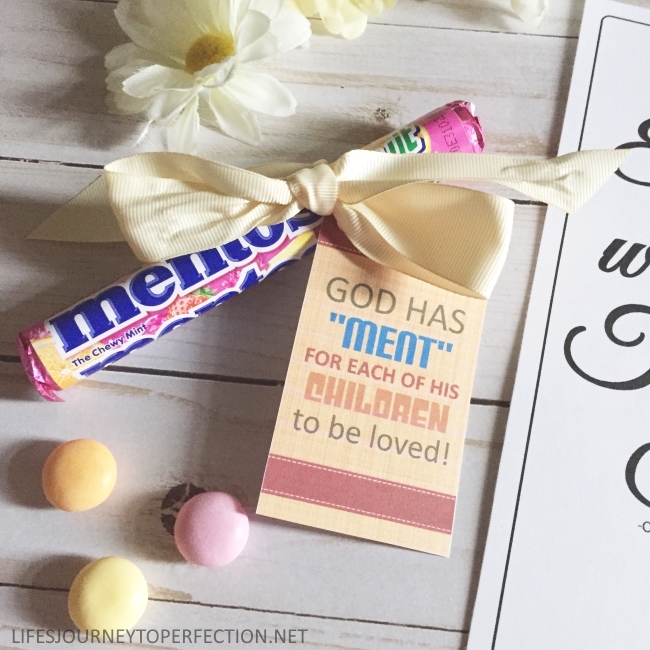 This fun tag can be attached to some Mentos candies. Kathy, were you trying to print it from a mobile device? It is crazy but there seems to be issues with printing from google docs with mobile devices. You can download it as a pdf and print it that way. Or really the best option is to print it from a pc. Let me know if you still have issues. The writer of this post has a great vision. The she see's about motivation and thanking messages to respond to a teacher is quite impressive. Really great idea. Appreciated!